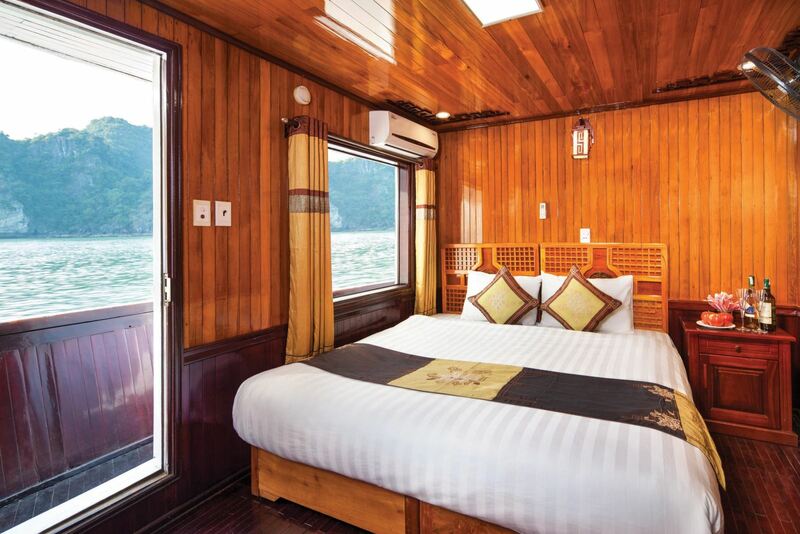 Outfitted in a traditional wooden style of elegant Asian inspired decor, Ha Long Seasun cruise spreads over 3 decks measuring 38 meter length, 8.5 meter width and 12 meter height. 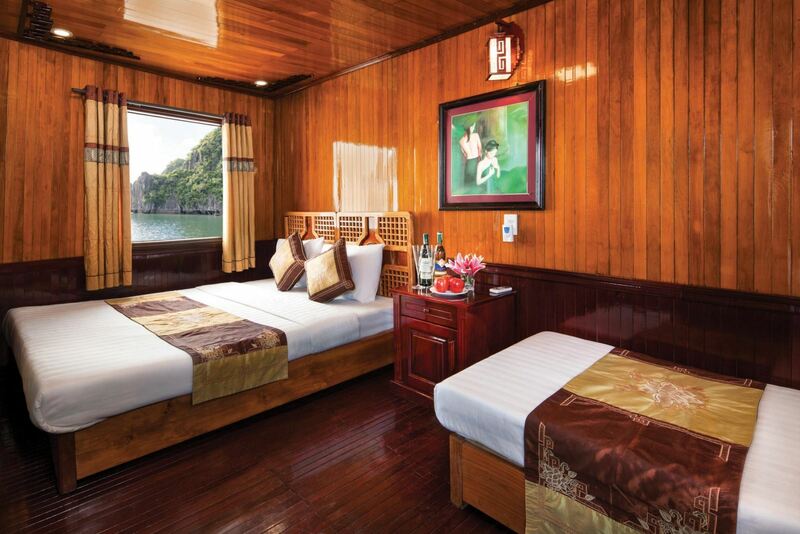 The combination between the classic beauty and modern comfort with 11 en-suite fully equipped and spacious cabins, bar, elegant dinning area, large sundecks and a professional team of crew, dedicated to every detail of personal services will make your trip with Ha Long Seasun cruise a truly unique and unforgettable experience. - Our team is enthusiastic, dynamic, well trained and dedicated. - Our itinerary with a difference gives you ample opportunity to experience an unforgettable vacation. 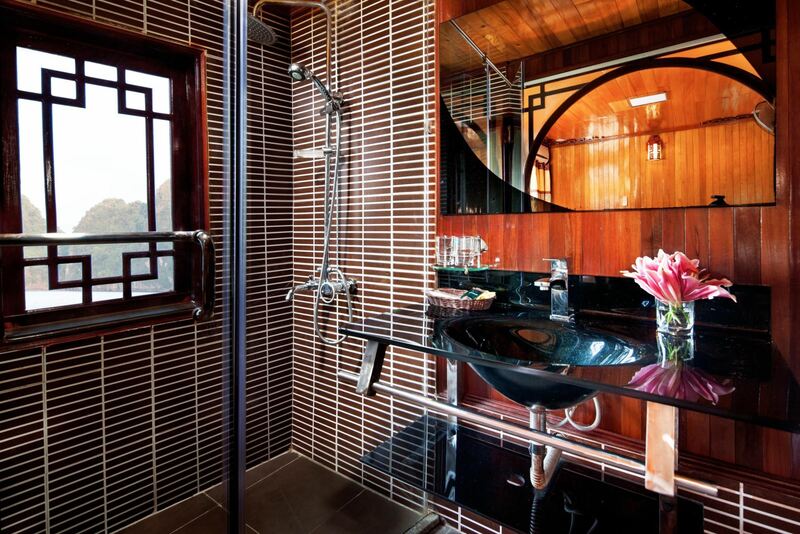 - Our guests are usually pleasantly surprised at how little they pay. - Our customer service is available 24/7. - Our careful attention to every detail. - We do what they say. 08:00: Hotel or private address pick up with our shuttle bus. Short break half way. 15:00: Drop anchor to explore Sung Sot Cave (Surprising Cave). 16:00: Enjoy kayaking and swimming or relaxing on the cruise. 18:00: Enjoy the complimentary sunset party on the sundeck with wine and fresh fruits. 21:00: Retire to your cabin, have a drink at the bar, sing karaoke, join the fishing excursion or play exciting games. Overnight on boat. 07:30: Breakfast will be served while we start our cruise to a local Pearl Farm. 08:30: Visit the local Pearl Farm. 09:30: Checking out your cabin and relax on board while our cruise is slowly sailing on the bay. 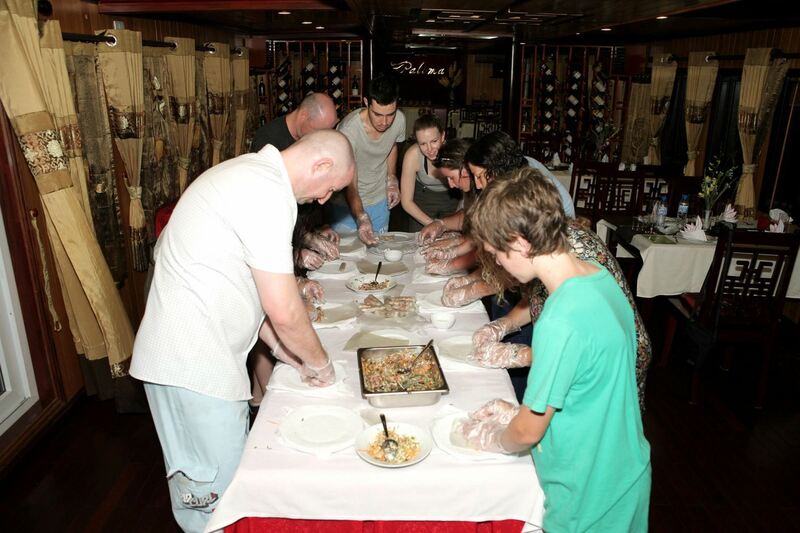 10:00: Join cooking class demonstration (teaching you how to make our specialty, Spring rolls) on board. 10:45: Lunch is served on board (or at a local restaurant). 11:45: Disembark at the harbor, Ha Long city. Take our shuttle bus to return to Hanoi. 16:30: Arrival back at your hotel or home. We offer a broad range of on board activities, facilities, side trips and excursions. Our main aim is to provide you with the best the region has to offer and perfect our on board activities. 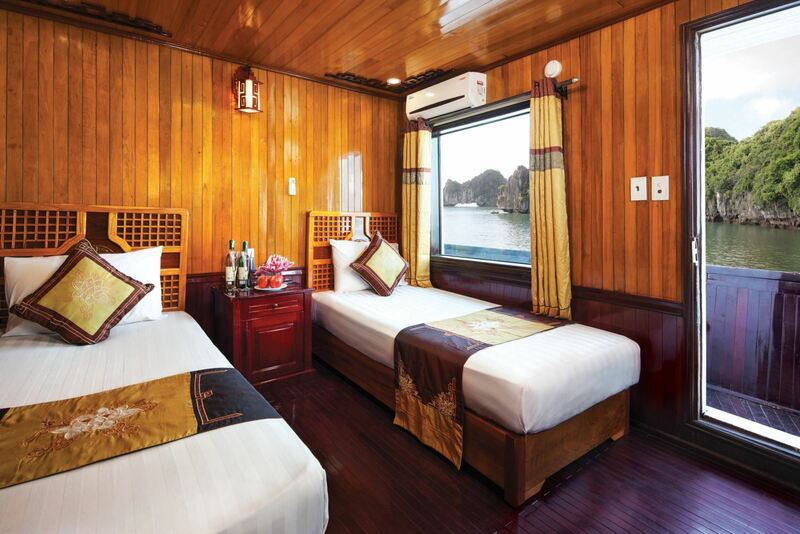 Outfitted in a traditional wooden style of elegant Asian inspired decor, Seasun Halong Cruise spreads over 3 decks measuring 38 meter length, 8.5 meter width and 12 meter height. The combination between the classic beauty and modern comfort with 11 en-suite fully equipped and spacious cabins, bar, elegant dinning area, large sundecks and a professional team of crew, dedicated to every detail of personal services will make your trip with Seasun Halong Cruise a truly unique and unforgettable experience. 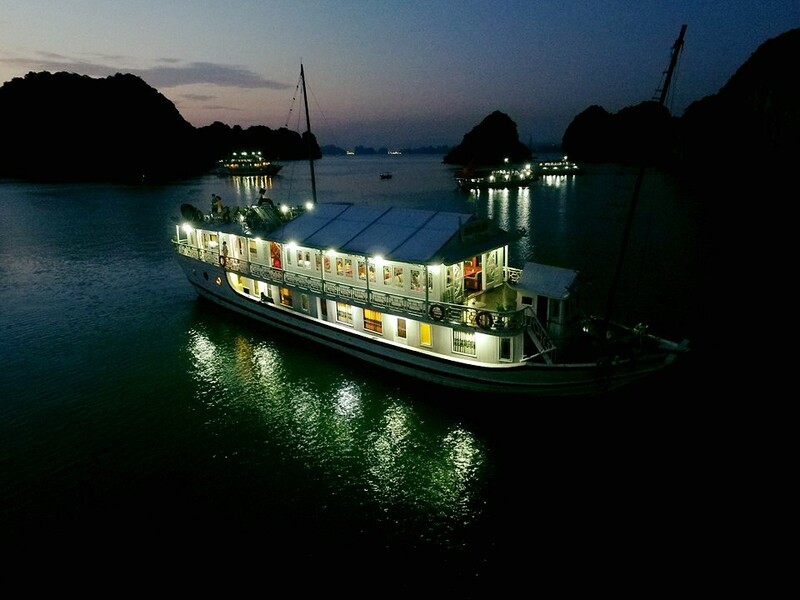 Book a cruise and Halong Tour directly through http://davidtravelagency.com get the best rates, big promotions and discover a different world with our Halong Bay Cruise and Halong Bay Tour. We offer a broad range of on board activities, facilities, side trips and excursions. Our main aim is to provide you with the best the region has to offer and perfect our on board activities. 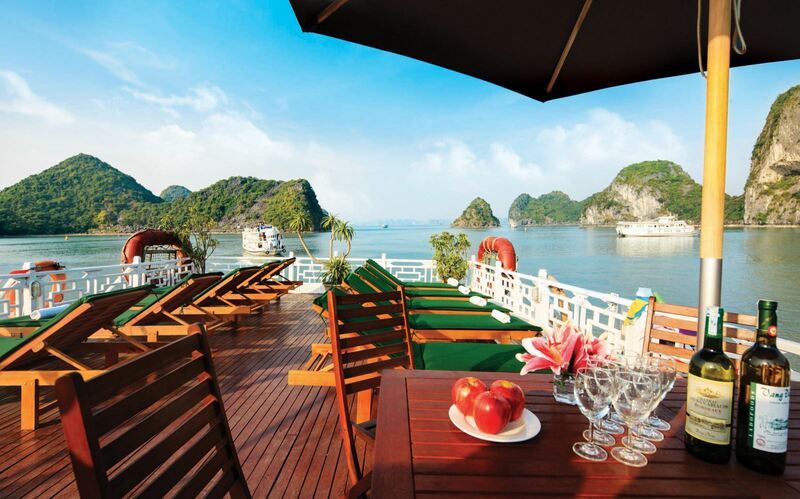 Halong Seasun Cruise will indulge you in any way possible and look forward to pampering you on your stay with us. What do you think of Seasun Cruise 2 Days - 1 Night? "Oasis Bay Cruise Was Fantastic"